It was bittersweet to leave the South Island of NZ as we watched the mountainous sounds drift from the back of our ferry. We had picked the morning trip with Bluebridge Ferries to Wellington for the slightly cheaper fares than their sole competitor, Interislander. While Bluebridge is more cargo oriented, it still offers an incredible viewing deck, two cafes, a mini movie theater, and free wi-fi. And to all those looking for a bargain, if you wait until the last 10 minutes of the cruise, the cafes will typically offer all their sandwiches and pastries for just a dollar! Ohh the things that the Murphys get excited about. We immediately had a great feeling about Wellington when we pulled into the beautiful harbor. As we had been told to expect, there was a crazy wind that whipped across the bay and over this hilly city on the water. Definitely bring your walking shoes here as our sweet little Airbnb apartment on "The Terrace" of the city required several hundred stairs to get to the next parallel street. 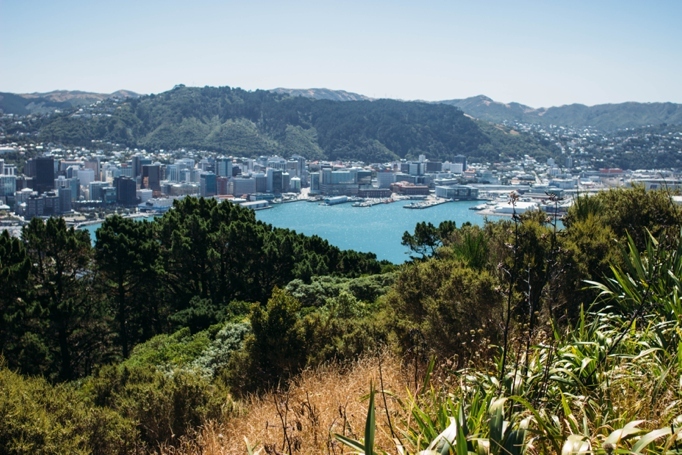 If we'd had any doubt of our affinity for Wellington, it was squashed as we saw the incredible selection of quality restaurants we had to pick from. Allegedly, the city has more restaurants per capita than NYC but, unfortunately, the meals will run you at about the same price. So we were quite relieved to find a common theme of "cheap and cheerful" asian noodle shops all over town to get more bang for your buck. Our first stop came by recommendation to Little Penang that served up a delicious rendition of the Malaysian dish, char kway teow - fried flat noodles with shrimp, pork crackle, sweet Chinese sausage, fried onion, and garlic...and it was just over $7. From there, a short walk down the lively Cuba Street brought us to, the aptly named, Fidel's for a divine dessert of mudslide coffee, tiramisu, and incredible apple pie (even by American standards). Definitely don't miss this place and make sure to ask the staff about any live music or concerts going on...they all seem to be on top of it. Needing to work off our residual food coma the next day, we headed up to the scenic Mt. Victoria lookout that offers an incredible vantage point of the city and out across the Cook Straight. You can easily drive to the top but there are a few little walking paths around the peak if you have a nice (and not too windy) day. While out of town, we fueled our inner geeks and continued 10 minutes further to the Weta Workshop where all the costumes and special effects were created for Lord of the Rings and a bunch of other powerhouse movies. Even for non-fans, it's very impressive to see the detail and work these teams put into their craft. Instead of paying for the full tour, we were happy with the free behind the scenes video that runs every 30 minutes...ohh and they have life-sized trolls. Of course we couldn't miss talking a walk down Wellington's happening waterfront. At around noon on a weekday, the boardwalk was full of food trucks, pop-up shops, runners, and people diving in for a swim on their lunch break. Our time in Wellington lined up perfectly with the sweet Jamie & Randy Watson (of Jamie Delaine Photography & The School Sessions) who were also traveling through NZ, so we met up for a little lunch at Mac's Brewbar by the water. It's always so fun to meet up with other travelers along the way -- especially other creative entrepreneurs. Thanks for your company, Jamie & Randy! Another great pitstop in the city was the Wellington Central Library (yes those still exist.) This detour was out of necessity, as we needed to print out copies of a rental car voucher, but we so loved seeing how spacious, clean and crowded this library was! (They also had an amazing section of magazines.) We quickly discovered that photography of the library is not allowed, but were able to snap one before getting gently reprimanded. In hopes of preparing our palettes for Southeast Asia, we chose the Vietnamese restaurant, Nam, for our last dinner in Wellington. Not as good as real Vietnamese food (as we now know) but still darn delicious. 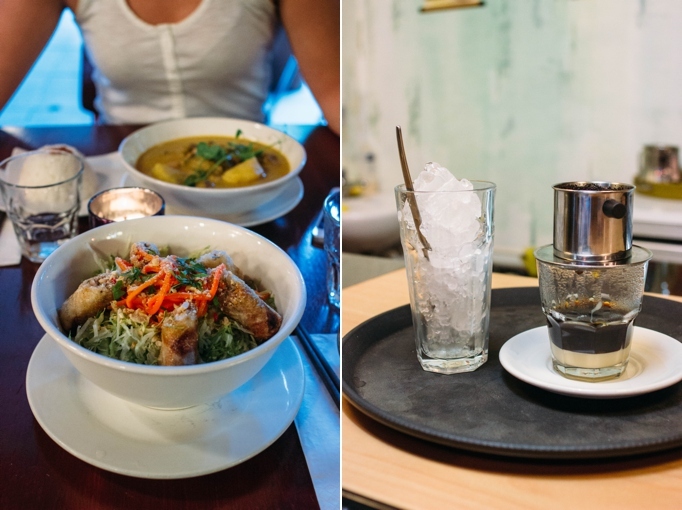 The most educational part of our meal was our first run in with Vietnamese iced coffee. We made the mistake of pouring the coffee over the ice, then trying to pour / mix in the condensed milk. It didn't work so well, but we learned a valuable lesson that helped us avoid future coffee embarrassment when in the real 'Nam. Before leaving this sweet city the next morning, we ventured down the 3 million stairs for breakfast at the Hangar, which proudly brews Flight Coffee (aviation pun intended, I assume) aka coffee geek heaven! They serve every variation of jo you can imagine - fancy espresso, Chemex, cold drip, Aeropress, v60... you name it, AND their branding and ambiance is totally on par. So long Wellington! Next up, Part 2 of our Travel Affordability series! (Missed the beginning? 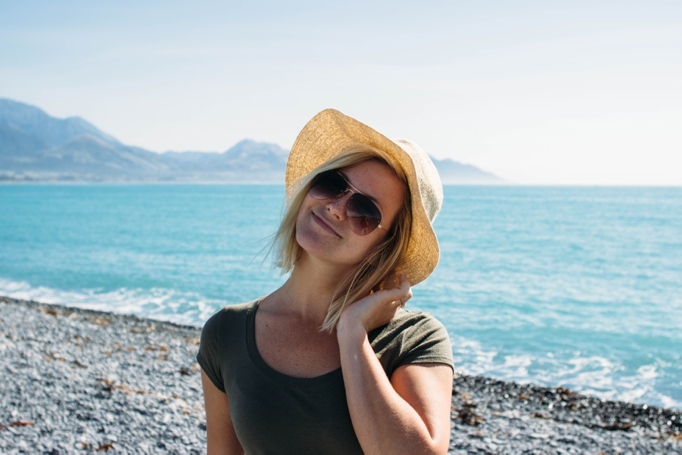 Check out Travel Affordability Part 1 here!) Do you have any ideas for future blog posts?! We LOVE getting feedback, so don't hesitate to reach out! 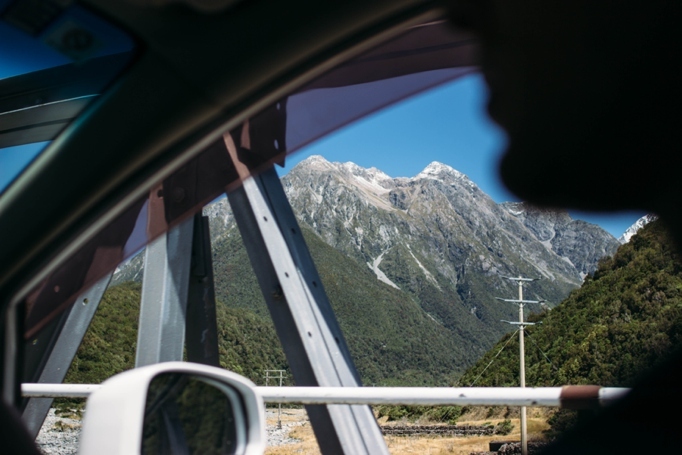 The drive north from Franz Josef glacier puts you right back on a section of New Zealand's gorgeous State Highway 6 also referred to as The Great Coast Road (not to be confused with Oz's Great Ocean Road). This winding drive's transition from ice-capped mountains to lush jungles to rugged ocean cliffs deservedly earned it a spot in Lonely Planet's list of the world's best coastal drives. Just over two hours into the drive, we came upon the fishing city of Greymouth where over 40% of the west coast's population lives. This is a great spot to load up on fuel and food if continuing north, as options tend to become few and far between. We decided on the delicious Speight's Ale House located in a beautiful, historic brick building just across the street from the Grey River. They serve a great variety of hearty meals that they help you pair with one of their award winning beers. After a thick clam chowder and a Speight's Gold Medal Ale, we were ready to continue north. The coastal vistas only got more impressive as the road continued. Signs started boasting "Penguin Crossing" but we unfortunately missed these tuxedoed fellas as they are most common from July to November in the early morning or late afternoon. 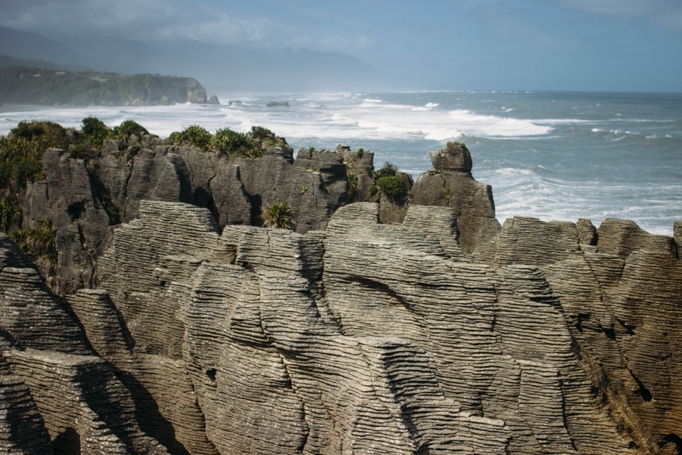 In just 40 minutes from Greymouth, we found ourselves at one of the west coast's iconic hotspots: the Pancake Rocks. We were a little wary at first when we saw dozens of cars and a full-scale gift shop across the road but realized it was all worth it once we started the 20 minute loop through these super unique rock formations. Try to aim your arrival time around high tide and you will hopefully be rewarded with awesome breakers crashing against these stacked flapjacks and (bear with me) impressive blowholes. Our trip then took us another 30 km north to the often overlooked town of Charleston. This post-mining community used to hold more than 15,000 inhabitants and more pubs than private residences but has since dropped down to under 300 permanent locals (and no pubs). 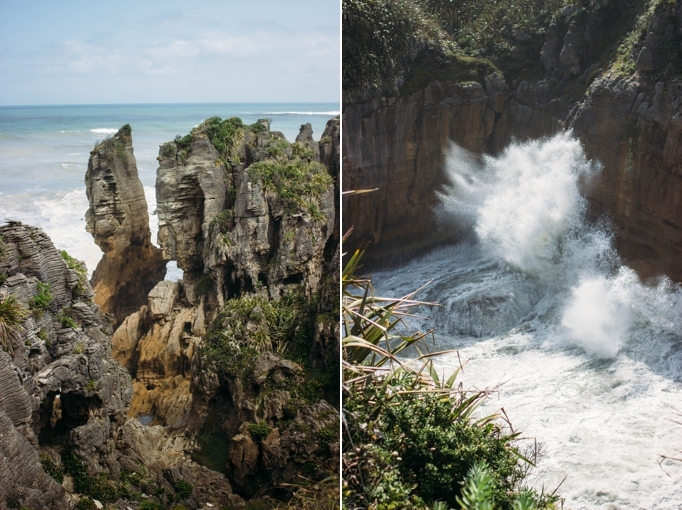 However, we were there for the quiet but rugged coastline and stunning limestone caves of Paparoa National Park. Our Airbnb at the rustic (and completely off-grid) Pyramid Farm certainly matched the serene and rural setting. The generous and fascinating host, Don (and his dog named Dog), also provided us with the most delicious honey known to man which he harvests right behind the house. For more substantial food, we would recommend the very local spot simply named Jack's that doubles as a camping ground and producer of the best pizza we had in New Zealand. There's no official address but watch closely for their wooden sign on your left about 5 or 10 minutes north of the town...and definitely don't let the drinking locals on the front porch deter you from the towns sole watering hole. 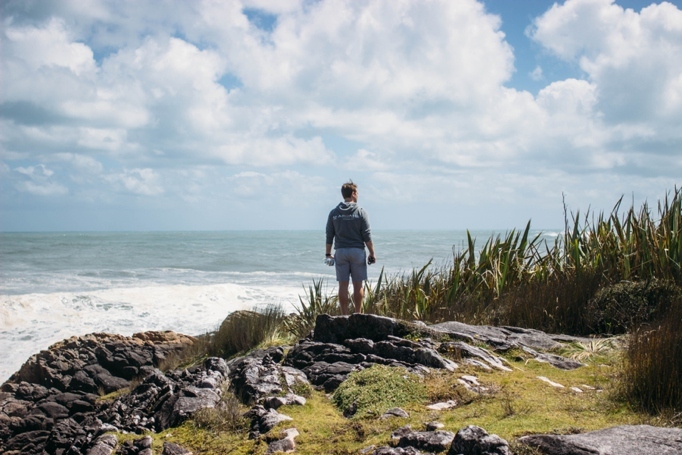 After talking with Don and other locals, we learned that most Kiwis prefer the impressive Nile River cave system of Paparoa over the more advertised (and touristy) Waitomo Caves of the North Island...and we totally understand why. *Also note that Waitomo does not allow any sort of photography, unlike the caves in Paparoa* We teamed up with the sole tour company in the area, Underworld Adventures, for an absolutely unforgettable day. Underworld suited us up with full wetsuits and caving gear before sending us out on an old mining train deep into the jungle. Each person then grabbed their own inner tube before trekking up to the entrance of the cave. The next few hours were spent touring through the colossal caves and forests of untouched stalagmites and stalactites. Once we made our way into the deeper chambers of the cave, we finally put those inner tubes we had been carrying to good use with a NZ activity we'd really been looking forward to: BLACKwater rafting! The same underground river that hollowed out these caves still rushes through and we jumped into it, tubes in hand. Now the real kicker was that, once the water started pulling us along, all headlamps were turned out and we were guided by the galaxies of glowworms that hung from the ceiling above us. Now we're talking about millions of faintly glowing stars that combined to create one of the more surreal experiences we've ever had. Who even knows how long we floated down the pitch black river watching the light show above us before the river dumped us back out into the heart of the jungle for us to float our way back to the train. Absolutely amazing! We were still recounting how awesome the caving trip was the next morning when we hit the road to make the drive across the island to Christchurch. 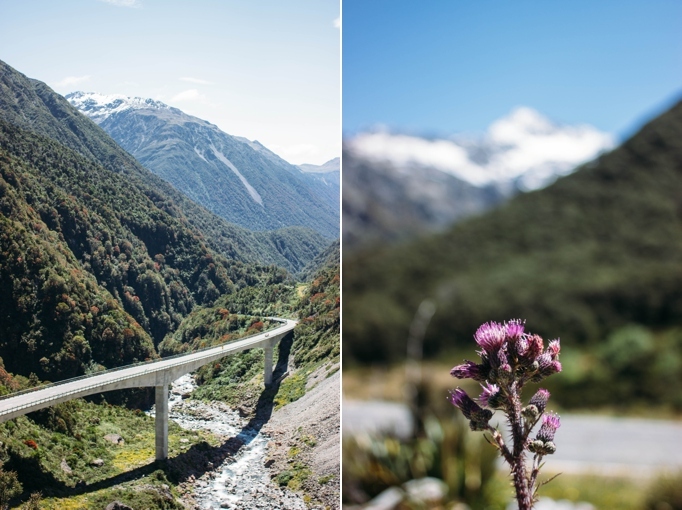 While not the most direct route, we chose to make our way back to Greymouth and head over the Southern Alps via the highly-recommended Arthur's Pass. It certainly did not disappoint. The road cuts through the heart of the snow-capped mountains, along rushing turquoise rivers, and dumping you out into humbling glacial plains. Get your arms (and stomach) ready for plenty of switchbacks along the way but there are great coffee shops on either side of the range to keep you fueled and ensure that you are awake for all of the amazing scenery out the window. We were a little surprised when we arrived to Christchurch to find that the country's third most populous city felt...deserted. The 2011 earthquake this city experienced killed 185 people and demolished much of the central town. This tragedy was still very evident as we wandered around Cathedral Square and the surrounding blocks of reconstruction. However, the resilient people of this city have far from given up and there are signs of a hip local community growing from the destruction. Delicious spots for breakfast/brunch like The Villas can still be found near the Canterbury Museum and great drinks and nightlife are alive and well across town at Revival Bar. We even found some incredible Mexican high-end cuisine at Tequila Mockingbird and its budget sister next door, Bueno Cantina. 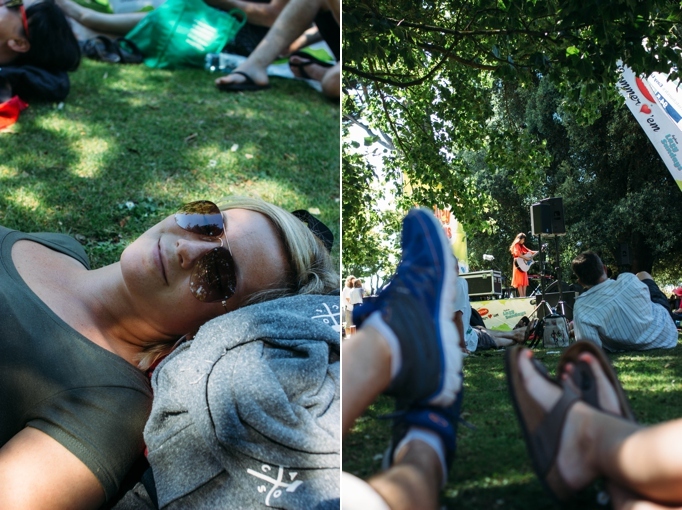 However, our favorite find was the Sunday afternoon concert series "Lazy Sunday" held in the botanical gardens featuring impressive musicians from all across New Zealand. A couple nights in Christchurch felt about right before dropping off our car and catching a bus up to Picton, the port for jumping a ferry to the North Island. 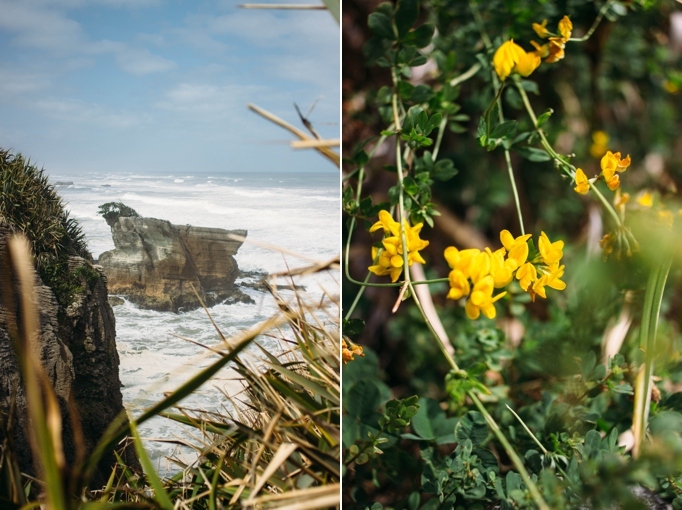 As we had come to expect, the drive itself was beautiful as we rode by rugged beach towns and seal colonies before jutting inland through the wineries responsible for NZ's infamous Sauvignon Blanc. The little town of Picton blended a bit of both sceneries with most of it's activity condensed into one main street facing the mountain-ringed shore. There isn't a strong restaurant scene in this humble town so we were content making our own dinner and watching the sun set around the quiet bay for our last night on the South Island. 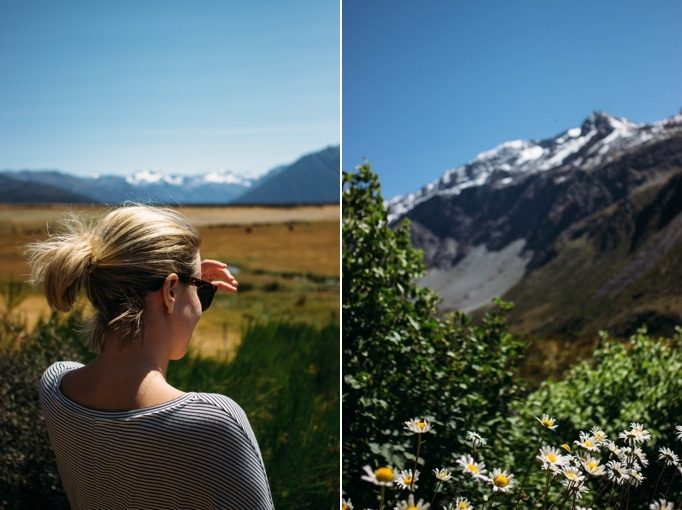 This was the last of our adventures on the South Island of New Zealand -- there's SO much more to explore (which just means we have to go back, right?!) Who is coming with us next time? Also, have any of ya'll been caving or seen any crazy glow worms? To say that we were excited about New Zealand would be an Orc sized understatement (sorry we aren't sorry for the Lord of the Rings references that will pepper our upcoming NZ posts). 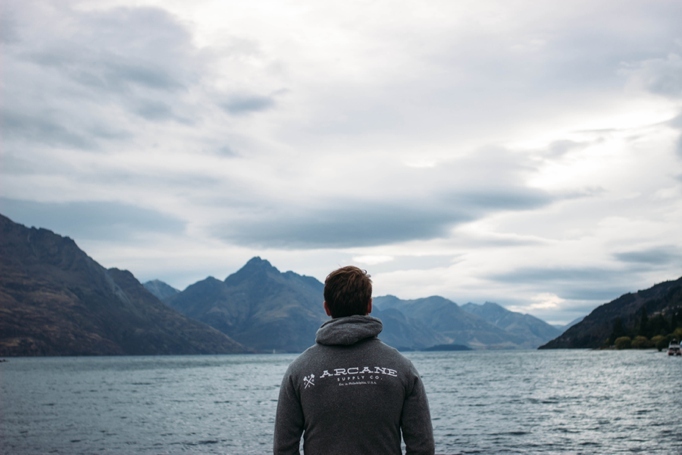 Self-proclaimed adventure capital of the world, the small city of Queenstown has no shortage of adrenaline-fueled activities for all interests, making it the perfect place to kick off our time in this stunning country. The town's placement sets that stage, nestled up against the massive Lake Wakatipu (over 110 sq. miles) and under the shadow of The Remarkables mountain range. Sure does make for an awesome backdrop. 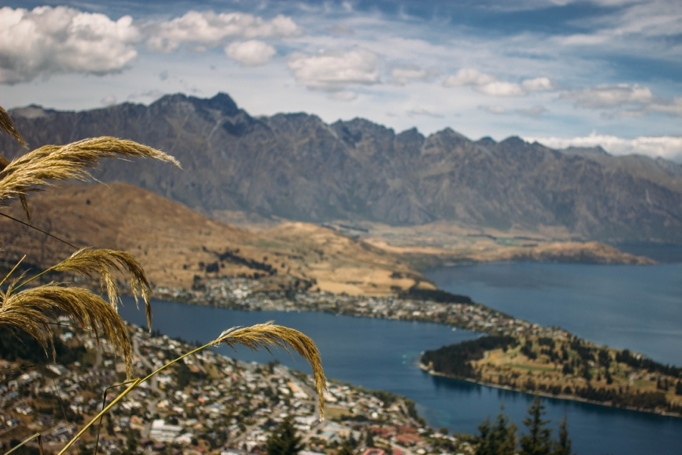 The global, amped-up crowd that this extreme town attracts creates a decidedly college-town feel for Queenstown. 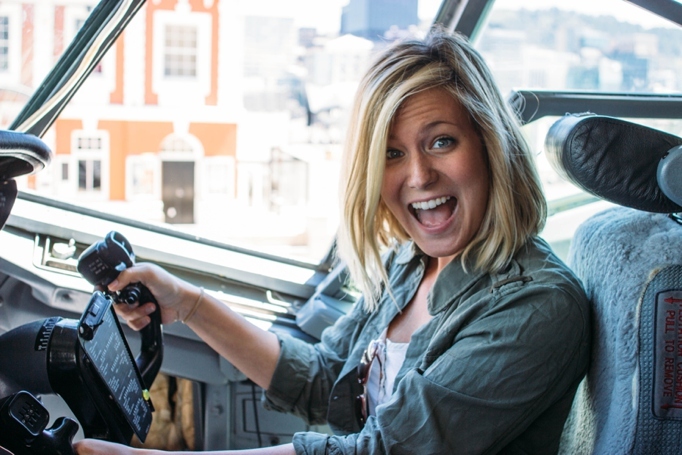 When it comes to lodging, definitely take this backpacker vibe into consideration. We were drawn into our first hostel of the trip at Base Backpackers thanks to a $15/night deal we snagged from NakedBus.com. While it was great for the budget, we realized that we enjoy the finer things in life like sleep, clean sheets, and not residing above an all-night dance club...call us old-fashioned. Regardless of where you lay your head, definitely make sure to join the group that congregates on the beach to hangout and watch some of the most amazing sunsets you will ever see. 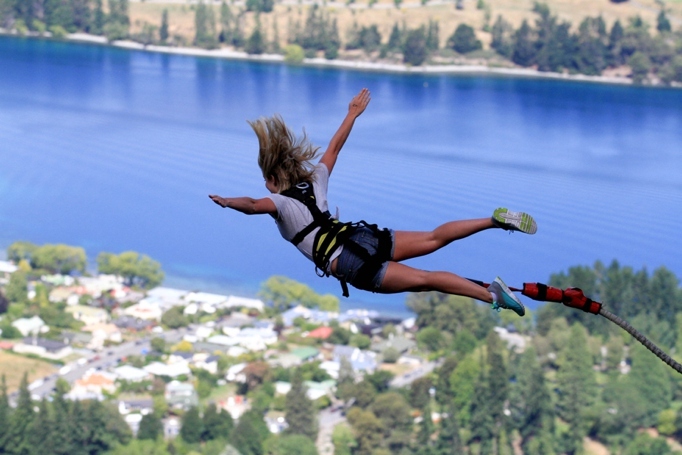 As you walk through Queenstown's quaint and cultured downtown, every third store advertises a different wild adventure: jet boating through canyons, cave diving, parasailing, paragliding, mountain biking, ziplines, heli-tours, luge, and the crown jewel...bungee jumping. Considered to be the birthplace of throwing your body off tall things with an elastic tied to you, we knew that we couldn't miss out even despite Julie's hesitation. In all fairness, she normally loves jumping off things but was afraid that her lunch would maintain its course when the rest of her body changed direction. We chose to go with AJ Hacket's Ledge jump because of their epic views of the city, lake, and mountains. IT. WAS. AWESOME. Of course we had to take the GoPro with us! Check out the first person view in case you're not sure if bungee jumping is for you...hopefully it will change your mind (but make sure to select the settings wheel and choose HD)! After the bungee splurge, our wallets were shrinking quickly (food in Australia and NZ is expensive, ya'll!) 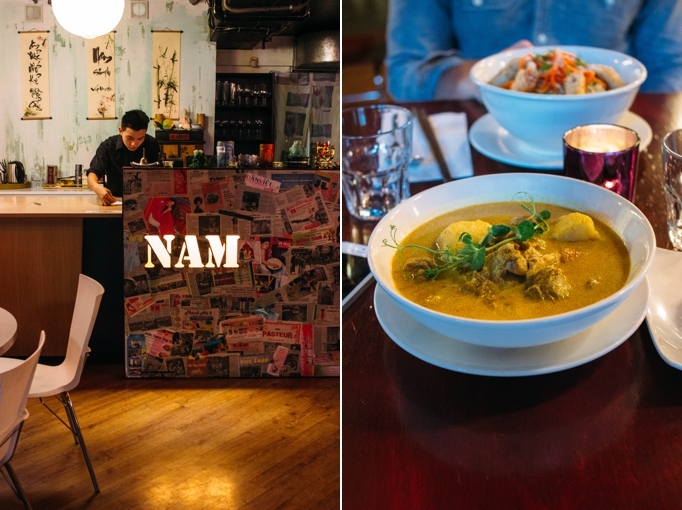 so we were on the hunt for some tasty cheap eats in Queenstown. Highlights include the infamous Fergburger (delicious burgers bigger than my head - would recommend going at some crazy odd time of the day if you want to skip the insane long line), Johnny Barrs (soup, salad, sandwich joint), Bob's Weigh (tasty & hearty breakfast), and @Thai (the hidden gem of a Thai spot with huge and tasty dishes). After two (long) nights staying in our downtown hostel (good riddance, to be honest) we were so thrilled to make the short 10 minute sunset drive to the sweetest AirBnB you ever did see! If you are staying in Queenstown and are looking for a comfortable bed, private bathroom, delicious breakfast and beautiful countryside views (ohh, and the friendly alpacas! ), we would absolutely recommend staying with Me Ae and Wayne in their beautiful home! They were interesting, gracious hosts and Me Ae was even kind enough to take care of our laundry while we were out adventuring! 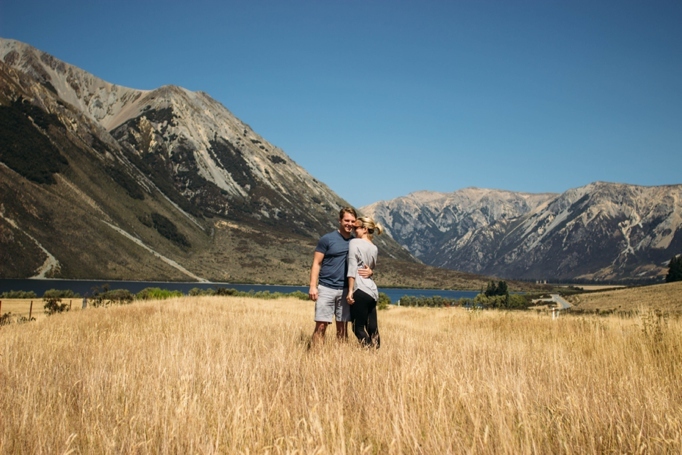 Have any other Queenstown recommendations that we missed? Which adrenaline activity would you pick (or have you already done)? We LOVED bungee jumping and are also looking forward to skydiving with our family once we're back in the States!